A conference on the subject of Vitamin D took place in London on May 23-25 2014. It was a big conference with presenters and delegates from all over the world. There were presentations of particular importance. Observational studies have consistently shown that people with high blood levels of vitamin D have many health advantages. A clear example of this from the UK is shown in Figure 1. We can see in the first group that “All-causes” death rate is almost twice as high in those with the lowest blood levels of vitamin D compared to those with the highest levels. Death rates are much higher for deaths from cardio-vascular disease, cancers and infectious diseases in those with the lowest levels of vitamin D.
If we are interested in good health and long life, we would want to be in the groups with the highest blood levels of vitamin D, greater than 30 ng/ml or 70 nmol/L. It would appear that the sensible way forward would be to give by mouth supplements of vitamin D so as to improve blood levels. This has been done on several occasions, but the results have been disappointing. This could be for a number of reasons. First the dose might have been inadequate to achieve a satisfactory blood level, but this has been checked in recent studies. 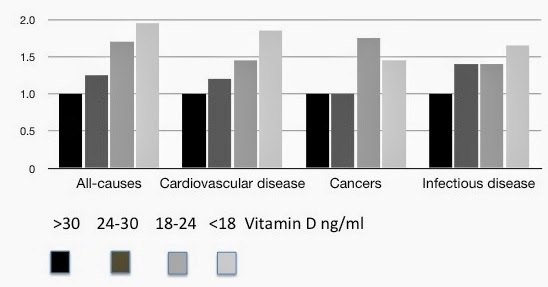 One piece of information that came out of the conference is that there does not appear to be an advantage in achieving blood levels of vitamin D above about 40 ng/ml (100 nmol/L). Second it might be necessary to start with a high blood level of vitamin D early in life, but it would take many decades for this to be investigated further. Third, it might be necessary to give the supplement for longer has been the case in the trials. Time will tell as more publications appear. The fourth explanation, and the most interesting, is that the blood level of vitamin D is a measure of the exposure of an individual to the sun. 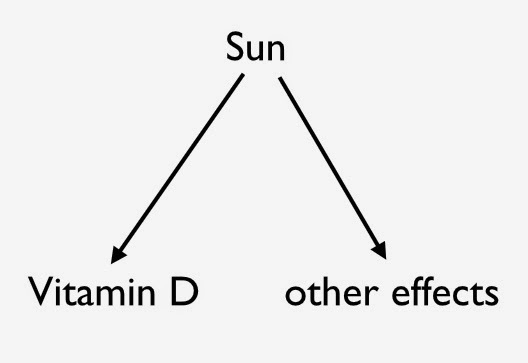 This suggests that vitamin D being an index of exposure to the sun might not be a substitute for the sun, which is of fundamental importance to human heath (and to that of all animals). The action of the sun on the skin converts 7-dehydrocholesterol (7-DHC) into vitamin D (cholecalciferol), which is then activated in the liver to 25-hydroxy vitamin D (calcidiol). A study from Edinburgh described in an earlier Post (Nitric Oxide) showed that exposure to ultraviolet light reduced the blood pressure of the subjects tested. 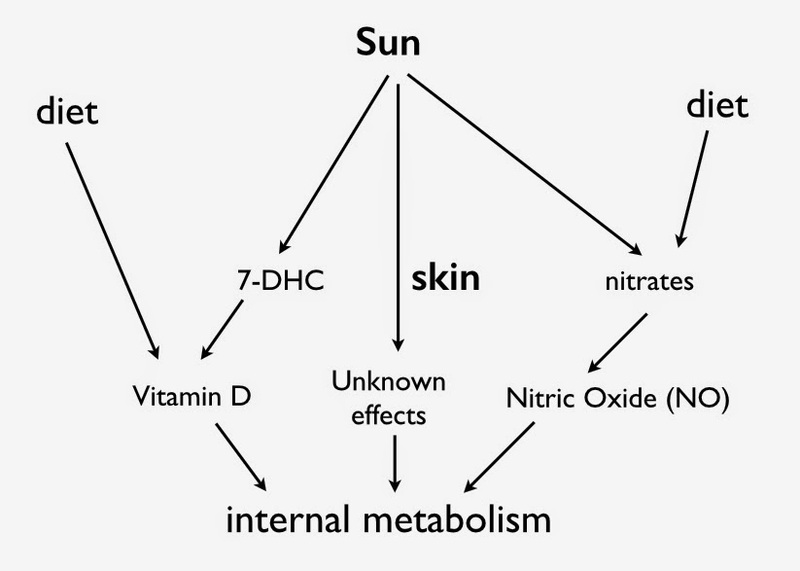 However there was no change in the blood level of vitamin D, indicating that the beneficial effect of ultraviolet light on the blood pressure must have been mediated by something other than vitamin D. The sun acting on the sun releases nitric oxide from nitrates in the skin and it is this that has a beneficial effect on the circulation. If people are deficient in vitamin D then a supplement by mouth will be of some benefit. It will heal the bone disease osteomalacia and there might be other benefits. However it would appear that vitamin D taken by mouth does not have the full range of benefits of the sun. It is course possible that the beneficial effects of the sun on the skin will include not only vitamin D and nitric oxide but that there might be other actions that have not yet been recognised.